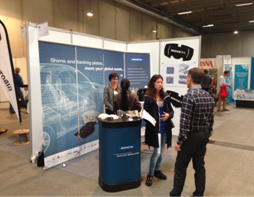 This years ‘Job- & Erhvervsmesse’ (which translates into something like ‘job & business exhibition/show’ was a great success. Meneta Group was present with own booth, manned by Michael Stærmose, Lotte Christiansen & Christian Kruse Trillingsgaard. The exhibition is perhaps best described as a ‘mixed zone’ of sorts, where employers/companies and job seekers can meet and establish first contact in informal settings. As is widely known, the staff is the best asset of any company, and this also applies to Meneta Group, of course – we hope to see some new faces around shortly.